20 S UMMER 2018 PracticeLink.com Work. 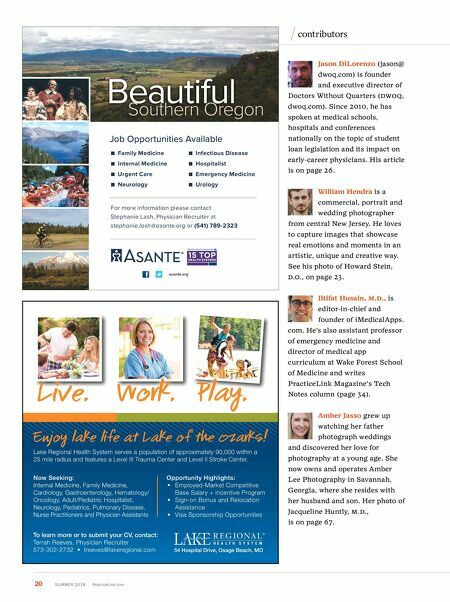 To learn more or to submit your CV, contact: Terrah Reeves, Physician Recruiter 573-302-2732 • treeves@lakeregional.com Lake Regional Health System serves a population of approximately 90,000 within a 25 mile radius and features a Level III Trauma Center and Level II Stroke Center. Now Seeking: Internal Medicine, Family Medicine, Cardiology, Gastroenterology, Hematology/ Oncology, Adult/Pediatric Hospitalist, Neurology, Pediatrics, Pulmonary Disease, Nurse Practitioners and Physician Assistants Opportunity Highlights: • Employed-Market Competitive Base Salary + Incentive Program • Sign-on Bonus and Relocation Assistance • Visa Sponsorship Opportunities 54 Hospital Drive, Osage Beach, MO Job Opportunities Available ■ Family Medicine ■ Internal Medicine ■ Urgent Care ■ Neurology ■ Infectious Disease ■ Hospitalist ■ Emergency Medicine ■ Urology For more information please contact Stephanie Lash, Physician Recruiter at stephanie.lash@asante.org or (541) 789-2323 Beautiful Southern Oregon asante.org contributors Jason DiLorenzo (jason@ dwoq.com) is founder and executive director of Doctors Without Quarters (DW o Q, dwoq.com). Since 2010, he has spoken at medical schools, hospitals and conferences nationally on the topic of student loan legislation and its impact on early-career physicians. His article is on page 26. William Hendra is a commercial, portrait and wedding photographer from central New Jersey. He loves to capture images that showcase real emotions and moments in an artistic, unique and creative way. 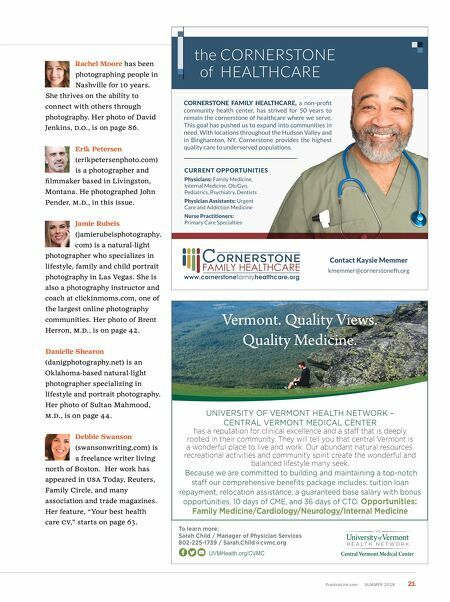 See his photo of Howard Stein, D. o ., on page 23. Iltifat Husain, M. d ., is editor-in-chief and founder of iMedicalApps. com. He's also assistant professor of emergency medicine and director of medical app curriculum at Wake Forest School of Medicine and writes PracticeLink Magazine's Tech Notes column (page 34). Amber Jasso grew up watching her father photograph weddings and discovered her love for photography at a young age. She now owns and operates Amber Lee Photography in Savannah, Georgia, where she resides with her husband and son. Her photo of Jacqueline Huntly, M.D., is on page 67.